We just launched a new landing page for RealBird and Homes By SMS members which can be used as a sign-in form for visitors at open houses. You’ll get the benefit of capturing visitor information for your follow up marketing, while visitors can use their smartphones and receive instant details of the open house by bookmarking your RealBird e-flyer. A new sign-in form landing page is now automatically created for all of your listings on RealBird. You can use it for-sale residential, rental and even at commercial open houses. 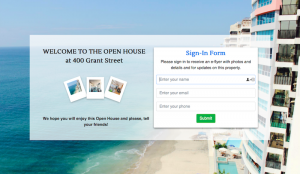 You can load this new open house sign-in form on your laptop or tablet as an alternative or side-by-side to paper sign-in forms or you can print and show the QR code that we provide as well, so that visitors can load the sign-in form easily and automatically on their own smartphone. Now that both Android and IPhone devices support QR codes natively with their built-in camera app, this is an easy and effective way to capture the visitor’s contact information for follow ups. Just login to RealBird, publish your listing and your new open house sign-in form is automatically created for you right away. p.s we are also started a new sweepstake and we’ll be giving away a Amazon Fire tablet. Just visit your Reward section on RealBird and invite your colleagues via that page to collect points. You’ll be automatically enrolled.